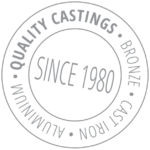 Using age-old methods to create moulds from hard sand or lost wax ceramic shell in a variety of metals, we are able to produce quality products. This hand’s on family business boasts over 100 years of moulding experience and produces quality products large and small. Billmans Foundry has steadily grown and enjoying a reputation for craftsmanship has seen its work exported to Europe and Asia. Being located in Castlemaine, Central Victoria (approximately 1.5 hour’s drive north of Melbourne) we have good access to several large transport companies, making it easier to look after our interstate customers. Always willing to accept a challenge and always under pressure from imports, our products show the craftsmanship of our highly skilled workforce. Proudly 100% Australian owned and made, Billmans Foundry continues the tradition of producing lasting products in bronze, cast iron and aluminium. We also specialise Bronze Fountains, Engineering Castings, Art Casting, Reproduction Casting, Light Columns, Cast Verandah Posts, Bollards, Park Furniture, Bronze Water Features and urns.